Want to have an authentic Italian meal, but stuck living in Manchester, NH? You can still get delicious food straight from Italy without even leaving home when you visit Bertucci’s. Our scratch-made dough, exclusive tomatoes, and roasted small-batch vegetables are always sourced fresh each and every day. Place an order for one of our brick oven pizzas, a specialty pasta creation, or a perfectly flavored dessert. Our chef has crafted an extensive menu suited to meet the needs of every patron! While we have the brick oven pizzas, custom calzones, and homemade pasta dishes our guests love and come back for time after time, we’ve also added gluten-free and vegetarian meals. This allows us to better serve everyone in our community. We look forward to serving you very soon, whether you dine-in or carryout. If you have an upcoming event, get in touch with us to cater. From lunchtime corporate events to small business meetings, we can create a memorable event for any occasion. 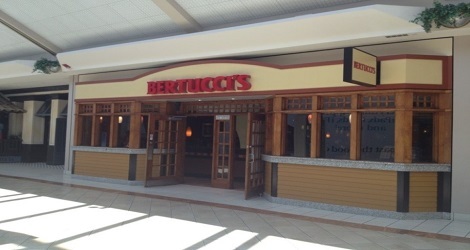 Located in the Manchester Mall of New Hampshire and minutes from the Cinemagic Digital Theater, Bertucci’s is the perfect location to have a laid-back dinner or a casual lunch. From romantic evenings to a night out with your friends, stop in and grab a bite at Bertucci’s.